What is it with toddlers and cupboard doors? They are naturally fascinated with opening and closing doors and of course checking out what you have stored away inside your cupboards. It is possible to simply train your toddler not to open any cupboards in the house and this may be the preferred option for you. I have in fact done this with several of my children, with the idea that I don’t want to clean up any more mess and that children need to know their physical boundaries and simply obey their parents. While obedience and boundaries are certainly important, I have slowly come around to the conclusion (helped by having twin toddlers) that it is simply easier for everyone if there is one special door (or drawer) that toddlers can be directed to when they are itching to explore. They will still gain the understanding that there are physical boundaries and need to obey when Mummy says “Don’t touch,” however being able to redirect that interest with the simple instruction to “Go to Jamie’s cupboard” makes obedience more palatable for them. Some parents use the plastic storage area, the pots and pans cupboard or clean out a bottom drawer. I have a ground level cupboard with a shelf that I fill with a small selection of books and toys and occasionally rotate. 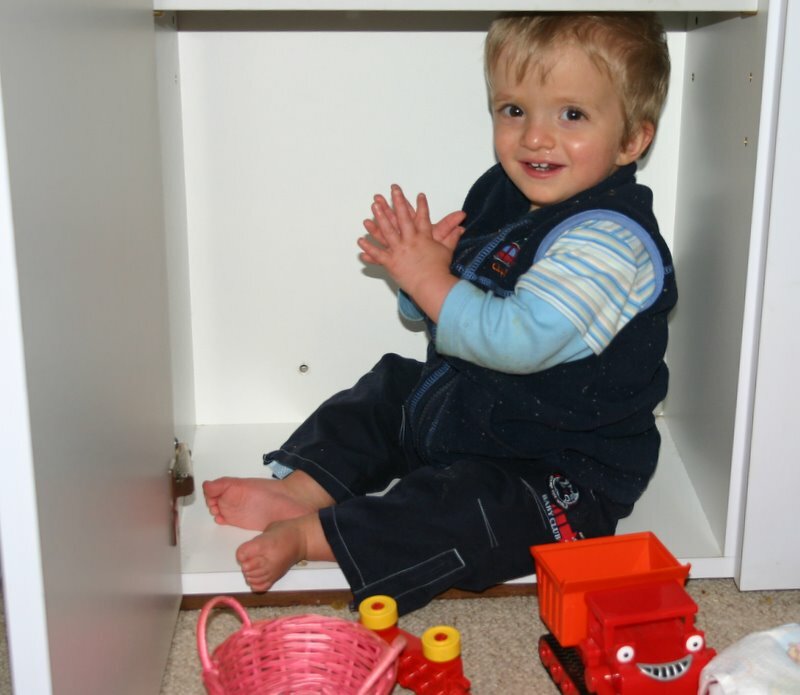 As you can see by the picture, the attraction here is the cupboard itself, rather than the toys and it didn’t take long for the twins to work out how to remove the little shelf and insert themselves – usually at the same time!